Blending the Baco 22A, Ugni Blanc and Folle Blanche grape varieties, the vintages produced in Ognoas boast the distinctive scents of vanilla and prune. 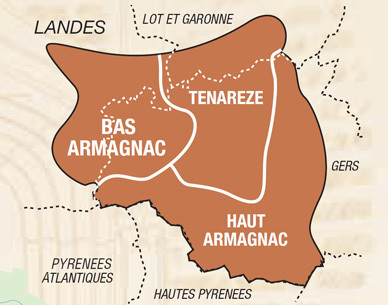 Of the three production regions (Haut-Armagnac, Armagnac-Ténarèze and Bas-Armagnac) which together form the Appellation d'Origine zone, it is Bas-Armagnac that produces the most renowned brandy. The Armagnac production area was defined by a decree dated 25 May 1909 with the aim of creating a high-quality “Armagnac” product and defining the precise boundaries within which it was possible to produce this specific type of brandy. With the decree of 6 August 1936, Armagnac was formally granted the status of appellation d'origine controlee (registered designation of origin). Armagnac is therefore one of the oldest appellations (designations). Armagnac brandy only exists because every year, the Gascony hillsides produce white grapes which, after being vinified, distilled and aged in oak barrels, will be used to produce future Armagnacs. This grape variety hails from central Italy. It is highly resistant to disease and produces delicate brandies. It represents 40% of the volumes of Armagnac produced. This is the only hybrid grape still used to produce an appellation contrôlée. It is very successful in sandy soils but dislikes limestone soils. Resilient and fruit-bearing, it gives rise to rounded, fruity brandies. As early as 1912 in Cazaubon and 1922 in Eauze, the brandies produced using this variety of grape were already deemed to be of the very highest quality. Created by a schoolteacher from the Landes region named François BACO (1865-1947), it accounts for 10% of the vines in the area. This is the oldest Armagnac grape variety and was predominant in the area before the vines were destroyed by phylloxera in 1878. At the time it was called “piquepoult”. The wine produced from this variety of grape, which is sensitive to grey mould and powdery mildew, has a high level of alcohol and a rounded texture. It accounts for 10% of the vines in the area. The appellation granted must be highly visible on all Armagnac brandy sales and promotional media. Four different appellations can be found on Armagnac brandy labels and must be followed by the note “Appellation controlee”.